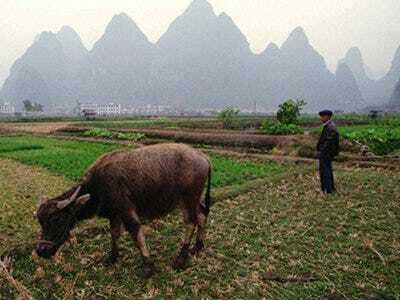 Real estate developers have bought up cheap land in rural China, despite laws against land hoarding. Some developers learned how to beat Ministry of Land and Resources’ (MLR) supervision system, which relies on satellite images to enforce rules against hoarding. Developers who sit on vacant land can use MLR insiders to tip them to upcoming fly-overs, then hire temporary laborers to pretend to build on the land when a satellite camera passes overhead. It’s not a bad sign that prices are forcing some developers out of major cities, as the ‘bubble’ will deflate as it expands. On the other hand, Beijing’s incompetence as a regulator is a very bad sign. This is their biggest failure since a purported crackdown on inflation was followed by a record-high land auction in the capital city.